I’ve never had any hesitation that moving to the little house on Van Buren Street was anything but the absolutely right thing for me to do. I just knew it from the very beginning. But if you’d asked me why I’d have a hard time telling you. I could have said “time for a change.” I could have said “easier to take care of.” I could have said “more quiet out there.” I could have said “it’s artfully remodeled” or “I’ll have my own studio.” And I did say all of those things. They’re all good reasons. But the real reason is not something that can be expressed as a reason. Like getting close to a wild animal, it’s something I’ve had to wait for. I catch fleeting glimpses, in moments when the light and shadow of the aspen tree outside my kitchen window dapples the window sill and cupboards as it “waves” to me, or when I hear new bird song through my bedroom window in the early morning. Such moments seal my trust a more full view will eventually unfold itself. I have a pair of white cotton capris I almost never wear. Even though they’re perfect for plenty of hot days in summer, I’m always saving them for a special occasion. One where I need to look nice but not be too dressed. One where I won’t be digging in the dirt or pulling up weeds or walking through dust or eating anything I might spill that would stain them. So of course they often hang in the closet all summer and never get worn, or get worn only once. That’s what happened last summer. But the other day I put them on. I’d had them hanging in the bathroom, awaiting that perfect day I thought might come but didn’t. Then I put them back in the closet. The next morning I took them back out and decided to brave the fear that they might be too dressy, too hot, get too dirty or that my underwear might show through in a way I’d rather it didn’t. I don’t know “why” I went back in and got them out of the closet. It wasn’t because I’d finally come up with a satisfactory answer to any of these concerns, real or imagined. I just felt like it, and didn’t want any of these things to stop me. The funny thing ended up being that none of these worries were the least bit of an issue, even though this was an ordinary day. I didn’t garden, but I drew with charcoal and I made bread—not exactly a recipe for keeping white pants spotless. Nevertheless, they were comfortable, and light, and I’m going to be really glad I didn’t miss out on wearing them, even without a special occasion. Deciding to buy, move to and begin the long slow process of settling in to my new place is a lot like the decision I made that morning to wear the white capris. I felt like doing it, in this hearing the-deep-tones-of-my-being chime sort of way. And I didn’t want to miss out on what felt so right, despite any number of objections or worries or obstacles that I could have let stop me. And as it turned out, because I didn’t let any perceived obstacles stop me, there really weren’t any. Certainly there were steps to go through, including the rezoning, but it was as if it was already a reality and all I had to do was walk through the steps that were already laid out so I could walk into the front door of a new stage in my life. The real obstacle was not getting caught up in transitory worry along the way. I’ve never really measured this, and it always comes out silky and smooth. These proportions are an eyeball guess for single serving. Put everything in a small bowl and mash it with a fork until creamy and smooth. If you need a dash more milk or carob powder, add it. Be careful with the milk– too much will water the richness down and make it too thin. Too little will make it more like banana fudge (not an entirely bad thing). Just the right amount turns it silky smooth. It’s all very forgiving. And you get it to taste as you go. To make pudding, triple the amount of banana (about half a big one) and add at least another tablespoon of carob, a little more ginger to taste, and enough almond milk to get the silky consistency. Put it in the fridge for a few hours or overnight. It is even more wonderful after it sits in the cool for a while. 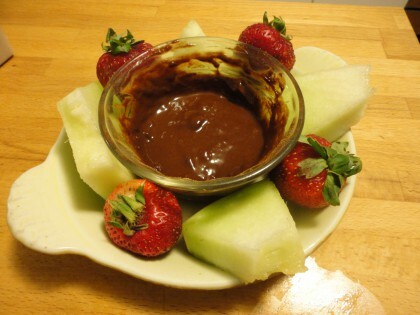 It can still be used as a dipping sauce that way too, but the texture is truly like a rich “chocolate” pudding. Of course you can do this with cocoa powder, too, if you want. But the carob is great with the ginger, and both are good for digestion, so I hope you’ll give them a try together. Living a bit dangerously, in the equivalent of your own white capris, of course.